Romance is never complete without a candle lit dinner and a bar of chocolate. In particular, chocolates do not only induce romance, but also provide an aura of consolation, relaxation and comfort. For Martin Ruga, though, chocolates are a source of livelihood. This is because the 27-year-old runs a chocolate processing business known as Desserts Anyone Limited. 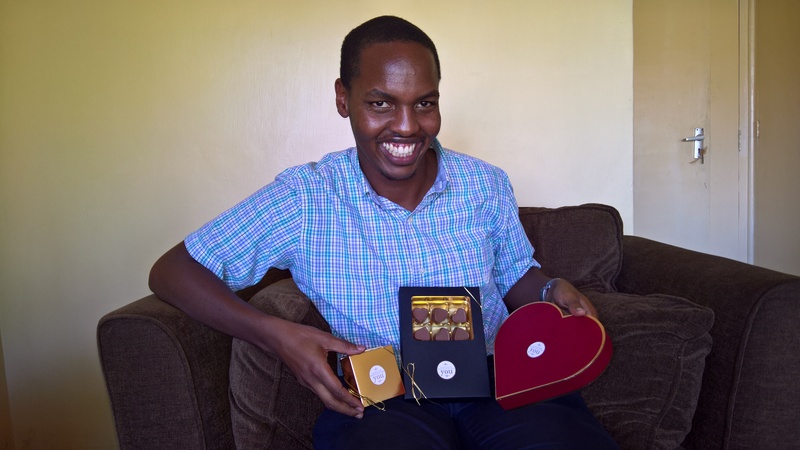 The business that is based in Baba Dogo, Ruaraka, in Nairobi, processes low or no sugar, cocoa-rich, whole-fruit infused or dairy free chocolates. “We are in the business of giving consumers the license to indulge in a guilt-free, healthy experience of their beloved chocolate,” says Martin Ruga. Ruga started the business as a gift to his friends and family members. “I started the business in 2015 after making a simple dessert that contained chocolate-coated strawberries for my friends and family,” he says. Armed with a capital of Sh. 10,000, Ruga decided to pilot a chocolate processing business. “I started by testing out my business hypothesis among my family and friends. The feedback was positive and it encouraged me that this was a business that could command a good market,” he says. He developed a business plan and a simplified test data that could show how and why his business idea could work. But his capital of Sh. 10,000 was too small to set off the business. “I knew that I would need more capital and decided to start applying for funding from angel investors,” Martin Ruga says. He applied for the inaugural Tony Elumelu Entrepreneurship Programme in 2015. Fortunately, his business pitch sailed through and he was awarded with a seed capital of Sh. 1 million (USD 10,000). “In the same year, my business was picked up by the Centum Investments Foundation for mentoring and resource provision, which helped us to lay a solid foundation on which the business stands on today,” he says. Despite receiving funding and mentorship, Ruga still faced numerous start-up challenges. He says that his biggest challenge was focusing on a small set of product ideas in order to get the business moving. “As entrepreneurs, we sometimes tend to generate ideas faster than we can execute them. This is a booby trap that I got caught up in. But as time passed, I learned to slow down and execute my business plan more stealthily,” he says. Ruga also reveals that his business is beyond its break-even point. “Our projections show that we shall be having increased profitability in the coming business periods,” he says. Over the past three years, Ruga’s business has grown from a team of one to about seven employees. During this period, Ruga has scooped equity investments from the KCB Lion’s Den entrepreneurs programme, completed fellowships with startup mentoring projects, and won the Young Entrepreneurs Awards’ top youth entrepreneur in the hospitality industry. Martin Ruga says that one of the key business lessons he has learned in his journey is the management of his cash flow. “No idea should be launched without piloting. This will save you from sinking too much capital in a venture that might turn out as a dead end,” he says. Though he has not suffered from any major financial losses, Martin Ruga says that he has had a loss of time with either delayed or hastened business decisions. “I have learned that as an entrepreneur, there are times when you need to be haste with decisions. This is not easy, especially when the decisions need retrospection and accurate business growth forecast,” he says.